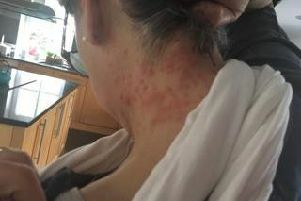 Police are looking for a red rug in connection with the search for missing woman Natalie Hemming. In a press conference this morning, Det Supt Chris Ward, head of Thames Valley Police’s major crime unit, appealed for anyone who has information about the rug to come forward. The rug is missing from the front room of Natalie’s home in Alderney Avenue, Newton Leys, Milton Keynes. It is described as being 12ft x 10ft, with a three-inch soft pile. The force want to hear from anyone who has seen the rug dumped, being transported or being discarded. They have also expanded the search to Aylesbury, Oxfordshire and the south Bedfordshire border. Natalie, a 31-year-old mother of three, was last seen shortly after 4pm on Sunday, May 1 in Hemel Hempstead, where she went to visit her mother. A man has been arrested and charged with murder as part of the case.